Worries over the political situation have sparked a run on Ukraine's banks, the country's central bank has said. 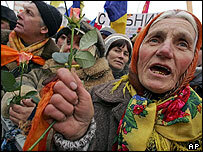 "Politicians started making political statements and people got scared," said central bank chief Arseniy Yatsenyuk. "And now we can see that in a few regions of Ukraine, people are withdrawing their deposits." Mr Yatsenyuk said the bank would strive to meet the demand for cash, and insisted that the financial system was still functioning correctly. Until Monday morning, Mr Yatsenyuk refused to admit that Ukraine's week-long political crisis had any serious financial ramifications. On Friday, he told reporters that the banking system was above political conflicts and was operating "like a Swiss watch". 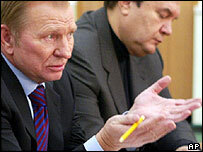 But earlier on Monday, outgoing President Leonid Kuchma warned that cash was running out. "A few more days and the financial system could fall apart like a house of cards," he said. "Neither the president nor the government can be held responsible for this... The government cannot work in a normal fashion." Credit-rating agency Moody's said it viewed "with caution" the situation, and might downgrade its assessment of the country's creditworthiness if matters did not improve. There is increasing evidence of economic disruption during the past week. According to local media reports, the country's foreign trade revenue is falling by some $4m per day, and there are warnings that a shortage of hard currency could soon hit the state budget. The number of freight lorries entering the country has reportedly dropped to one third of its usual level. The central bank has spent some $400m of its $10bn reverves in defending the hryvnya, which is coming under pressure as savers exchange their cash into dollars and euros. Establishing a true picture is difficult, however: backers of Prime Minister Viktor Yanukovych are keen to spark fears of economic crisis, since their popular base is the industrialised and trade-dependent east of the country. The government has warned that miners' wages may soon be disrupted, something likely to cause agitation among the most militant and influential Yanukovych supporters.